Francis Crick Institute scientists led by Sir Paul Nurse have resolved a long-standing debate in the field of cell cycle science. In doing so, they have revised the textbook explanation for how the process of cell division is controlled by a protein called CDK. CDK stands for Cyclin-Dependent Kinase. The discovery of this family of proteins won Paul Nurse, Director of the Crick, a share of the 2001 Nobel Prize in Physiology or Medicine. Now, his lab has found convincing evidence for the 'activity threshold model' for CDK. This model proposes that CDK controls cell division simply by turning on the proteins needed at different stages of the process based on increases in its own activity level. Matthew Swaffer, in Paul Nurse's lab, explains: "When a cell divides, it has to replicate its DNA (S-phase) before it then separates the DNA into two daughter cells (mitosis). The correct timing of these two events is critical as incorrect replication or separation of DNA can cause dangerous mutations that might help cancer cells to escape the checks and balances that control division. "S-phase and mitosis are controlled by CDK, a master-regulator enzyme that changes other proteins inside the cell by chemically adding a phosphate group to them. This process is called phosphorylation and it works like a switch to turn on the protein which is being modified." 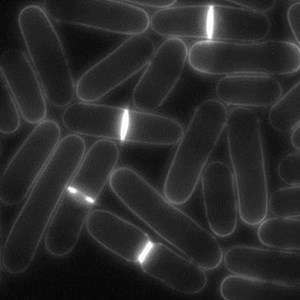 Because human cells are very complex, the researchers studied fission yeast, which is simpler and easier to manipulate. This allowed them to re-engineer CDK to directly test their theory. They combined this approach with a sophisticated technology called phosphoproteomics. Co-authour Bram Snijders, also at the Crick, explained that "the powerful phosphoproteomics approach enables measurement of the phosphorylation levels of thousands of proteins at the same time". The team found that different proteins are phosphorylated, and therefore turned on, at different times during the course of cell division. Via phosphorylation, CDK turns on proteins involved in the S-phase early in cell division, while proteins necessary for mitosis are switched on later. Importantly, the scientists discovered that the time at which different proteins are phosphorylated is determined only by the activity levels of CDK itself. S-phase proteins are switched on earlier because they are easier for CDK to modify and become phosphorylated when the activity of CDK is still low at the start of cell division. Later in the process, after the enzyme activity of CDK has increased, the proteins involved in mitosis are phosphorylated by the higher CDK levels. Dr Swaffer says: "The 'activity-threshold model' was first proposed in 1996 in Paul's lab. However, for the past 20 years it was not widely thought to be central to the process of controlling cell division. This study provides direct evidence to support this model and answers a number of key questions in the field. "Understanding how CDK regulates cell division in yeast tells us a lot about how the same processes work in human cells, which is central to our understating of cancer because cancers arise when cells divide uncontrollably."